A combination of discredited economic policies, cuts in welfare and callous neglect of agriculture has turned the people of Rajasthan against the BJP-led Raje government. It was the best of times for the BJP in Rajasthan: they swept the assembly elections in December 2013, winning as many as 163 seats in the 200-member Assembly, reducing the incumbent Congress to a humiliating 21 seats. Within months, Modi led the BJP to power at the Centre too. What more could you desire? Yet five years down the line, BJP Chief Minister Vasundhara Raje is fighting a losing battle in the state. Various ground reports, and pre-poll surveys appear to indicate that the BJP is on its way out. Raje’s tours of the state have received indifferent reception, Modi’s rallies are not inspiring the same zest as before, Amit Shah’s supposed master strategy of organising the campaign is stumbling and floundering. Money is reportedly flowing like water, the state is bristling with BJP hoardings and flags, but the energy is not there because the people are sullen and discontented. It is customary among media commentators and pollsters to ascribe electoral ups and downs to things like caste, individual popularity (or otherwise), rebellion and factionalism etc. This can be called the royalist or palace intrigue method of election analysis. “Raje is losing the polls because she is not available after eight o’clock in the night”. “Rajputs are angry because of Padmavat”. “BJP is losing many seats because of bad ticket distribution”. And so on. Such analysts are averse to look for deeper causes, partly because of ideological hostility and partly because it requires too much work. And then, it becomes a circle – everybody writes or says that caste equations are causing damage to Raje, and they refer to each other approvingly – that becomes the ‘truth’. 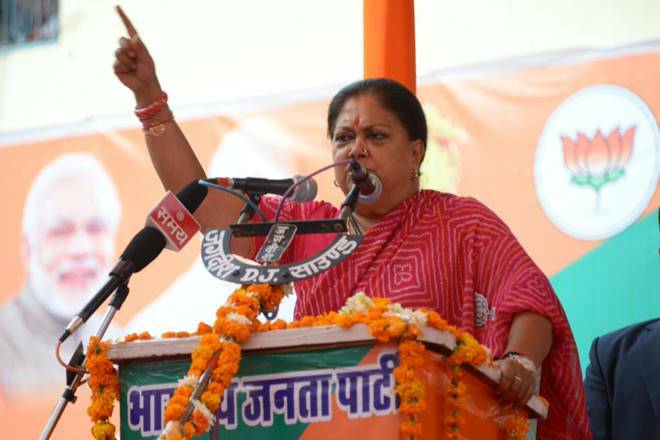 In Rajasthan, there is groundswell of anger against the aggressive economic policies imposed by the Raje government, egged on and applauded throughout by Modi and his apologists in Delhi. Here are some prominent features of these policies. Neglect of Farmers: The Raje government aggravated the already existing imbalance between the farmer and the inputs he/she uses for cultivation by allowing prices of essential inputs like electricity, diesel, seeds, fertlisers, pesticides, etc. to increase unchecked. It refused to either hike (or add to) the Minimum Support Prices (MSPs) or increase procurement by setting up widely distributed procurement centres. As a result, big farmers and more importantly, big traders, looted the small farmers at will, driving down prices. The whole MSP system practically collapsed. For instance, in October this year, jowar was sold by farmers at an average price of Rs 1,829 per quintal compared to the MSP of Rs 2,340. Urad dal was sold at Rs 2,904 per quintal average price compared to the MSP of Rs 5,600, as reported earlier by Newsclick. As a result, there developed extensive discontent among farmers which broke out repeatedly in the form of huge struggles for better prices. In 2017, the state government appeared to bow to the demands, but then backtracked, and in fact, cracked down on protesters, arresting their leaders and stopping the farmers from marching to Jaipur. This betrayal further added to the anger of the farmers. Rural Wages Stagnant: Between January 2015 and August 2018, wages of agricultural workers increased from Rs 278.67 per day to Rs 291.25 for men and from Rs 202.73 to Rs 254.00 per day for women, according to the Labour Bureau. That’s a rise of about 4.5 per cent in three years and eight months. The inflation rate itself is about 4-5 per cent per annum. In other words, real wages seem to have declined under the BJP rule in Rajasthan. This stagnation in agricultural wages is a key factor behind the anger among the vast number of agricultural workers in the state. Industrial Workers Anger: Industrial workers in the state have borne the brunt of an unbridled attack by the Raje government. This has taken the form of a massive dilution of labour laws, much more than the Modi government has dared to do at the country level, and also a wage squeeze, which is reflected in the fact that minimum wages in Rajasthan are among the lowest in the country. As per the latest notification in 2018, the minimum monthly wage rate is Rs 5,538 for ‘unskilled’ workers, Rs 5,798 for ‘semi-skilled’ workers, Rs 6,058 for ‘skilled’ workers, and Rs 7,358 for ‘highly skilled’ workers. Note that the minimum wage calculations show that Rs 18,000 is the minimum requirement for a family of four, and this is what is recommended for central government employees. This combined with the free rein given to industrialists to hire and fire workers by diluting the relevant provisions of the ID Act and the Factories Act has pushed workers to the brink. They are seething with anger at the Raje government. Joblessness: According to data collected by Centre for Monitoring Indian Economy (CMIE) this year, youth (20-29 years) unemployment rate in Rajasthan has soared to unprecedented levels, one of the highest in country, and has reached 55 per cent. Even among graduates, joblessness is raging at a whopping 21 per cent. Among women, it is 53 per cent. The loss-making nature of farming in the state, the low rates of wages for agricultural and industrial workers, the squeeze in public expenditure and investment have contributed to this situation, as has the fact that mitigating measures like the rural jobs guarantee program etc. have been floundering. The Raje government has remained a mute spectator to this growing distress. This has caused a deep and undiluted anger to build up among the people, especially youth. It must be remembered that large sections of youth had voted for Modi in 2014 based on his promises to provide jobs to 10 million people. In Rajasthan too, in the campaign for 2013 Assembly elections, similar state-level promises had been made by Raje and others. Hence, the sense of betrayal is all the more aggravated. In addition, the state government has racked up an enormous amount of debt as per RBI – some 33.6 per cent of the GSDP, compared to 23.3 per cent in 2014 when the Raje government took charge. Most of this debt is owed to banks. And, the increased liabilities have not meant that more money is being spent on people’s welfare. In fact, development expenditure as a share of aggregate expenditure has declined. These are the real reasons why the Raje government is set to lose in Rajasthan. And, it is a lesson for Modi too – for his government has been following similar policies throughout the country.